Chuck Willis was born on 31 January, 1928, in Atlanta, Georgia. He was discovered in a talent show and became a big-band singer. He then signed with Columbia, releasing all but his first record on the Okeh subsidiary label. 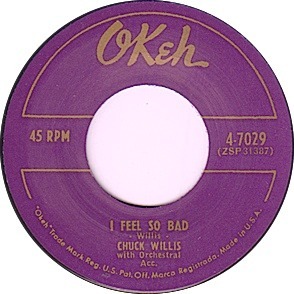 The exact date on which Chuck Willis recorded the original version of his own "I Feel So Bad" is not known, but the matrix number of the recording (CO49813) indicate that it was made in September 1953 (The Originals Project shows 17 September). Willis moved to Atlantic in 1956 and soon had a hit with his version of C.C. Rider, earning himself the nickname of "King of Stroll," the dance with which that number was linked. Elvis's version of "I Feel So Bad" closely follows Chuck Willis's in both style and arrangement. Note that Lightnin' Hopkins recorded a number called "I Feel So Bad" in 1946, but it's a completely different song!